This post is all about celebration – about finishing my first basic term @LCB passing all my assessment, about flying to Brisbane in a few days for vacation, and about finally successfully making a mousse sphere for the first time (after contemplating on it for a thousand years). This hazelnut chocolate mousse sphere is my cup of tea, hands down – it marries my favourite flavours into one dessert that tastes absolutely divine. I’ve always wanted to make mousse spheres but I was too scared to, until I recently watched Zumbo’s just dessert which motivated me to be a better “dessert maker”. While I was watching all those amatuer home-bakers produce their eye-opening, beautiful desserts, my heart ached for creating some of my own. As I said, this dessert is celebratory, so I decided to apply some of the skills I learnt from school to it. It is also inspired by the Shiny Mirror Glaze Mousse Dome with Crispy Chocolate Base and Ganache Topping created by Cupcake Savvy’s Kitchen. 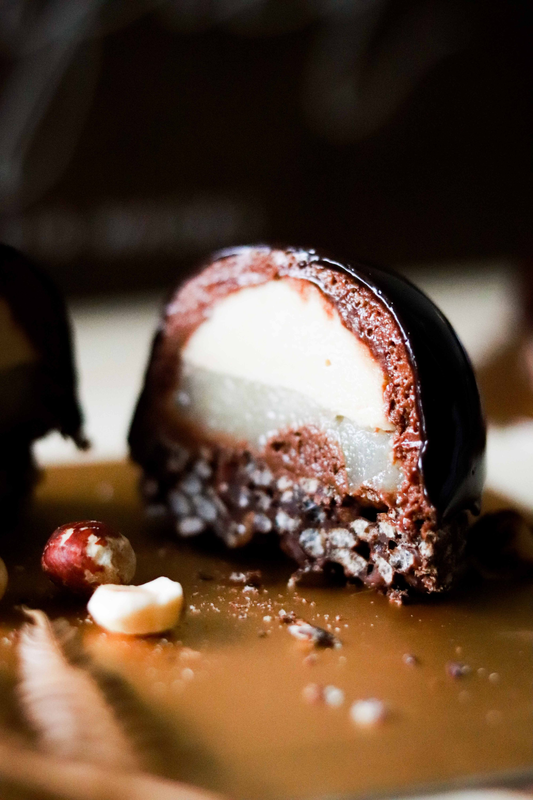 Cutting through the sphere, you get a smooth French hazelnut chocolate mousse, creamy coffee creme patissiere, and a layer of refreshing poached pear that balances the richness & sweetness of chocolate. The dessert’s crunchy texture is provided by a crispy rice puff chocolate base (who doesn’t like indulging him/herself in loads of cocoa rice puffs??? ), and I finished it off with a shiny chocolate mirror glaze that renders the dessert a sophisticated look. How does that not sound heavenly? Realistically speaking, baking at home can be a bit tricky at times because you don’t always get the equipment or tools you need for your recipe. Like this time, I didn’t have a smaller sphere mold for my coffee creme patissiere so I had to carefully spoon it into the large mold, which could create a bit of a problem in terms of even layerings. But well, as as a pastry chef wanna-be, I need to be adaptive and make use of what I’ve got at home. Although the end result isn’t as perfect as I wanted, I am already quite happy with it. Anyway, give this recipe a go – If you are a hard-core chocolate fans, I think you will fall in love with it. Have a good weekend! Using a double boiler, melt the chocolate on low heat until melted. Let it cool slightly. Stir in butter and nutella. Set aside. Using a whisk, lightly beat egg yolks until pale and creamy. Add to the chocolate mixture, mix well. Using an electric mixer, beat egg white until foamy. Gradually add sugar and beat egg white to stiff peaks. Gently stir in the chocolate-egg yolk mixture (in three additions) into the egg whites, mix until no obvious egg white is visible. Using a saucepan, heat milk and instant coffee powder over medium heat and bring it to boil. While the milk is being heated, add egg yolk, sifted corn flour, caster sugar in a bowl. Mix well with a whisk until you can a thick, creamy consistency. With a steady mixing motion, pour 1/3 of the milk mixture to the egg mix to temper the egg. Pour the above mixture into the saucepan and cook over medium heat while whisking vigorously for at least 3 mins, until all starch is cooked. You will know it’s almost ready when it starts to bubble. Continue cooking for 1-2 mins. Remove it from the heat. Whisk in the butter and coffee liqueur until incorporated. Pour the custard into a bowl and cover the custard surface with a plastic wrap. This will prevent a skin from forming on top. Let the custard cool to room temperature. Refrigerate until ready to use. Put all ingredients (except the pears) in a pan. Peel and core pears, gently poach (NOT boil) pears in syrup. Cook the pears for about 1 hour until they are soft. Use a stick to test every once in a while to see if the pears are done. When done, take out the pears from the pan to stop the cooking process. Cut one poached pear into small cubes, and blend the another one into puree or mash it with a fork. Pour the pear cubes into the puree and mix well. Refrigerate until ready for use. Using a double boiler, melt chocolate on low heat until melted. Pour the chocolate onto the rice puff and shape the mixture into a 2-cm thick layer. Add gelatin and cold water into a bowl. Stir and set aside until ready to use. In a saucepan, add sugar, cocoa powder, water and cream. Mix well with a whisk. Over medium heat, bring the mixture to boil while stirring continuously. Cook for about 2 mins until the mixture is smooth and no lump is visible. Turn off the heat, add the gelatin mix and stir well. Set aside and let cool to at least 35 C for usage. Put the hazelnut chocolate mousse into the mold. Smoothen out the surface with a spoon until you can an even layer as the outer layer of the sphere. Freeze for 15 mins. Then, put the coffee creme patissiere in the mold. Freeze for 15 mins. Then, pour the pear mixture into the mold. Leave some space for the next step of closing the sphere with the hazelnut chocolate mousse. Freeze for 15 mins. Then, close all the spheres with a thin layer of the hazelnut chocolate mousse. Smoothen the surface with a off-set spatula. Freeze for at least 3 hours or preferably overnight to let it set completely. Carefully push the spheres out of the mold and put them on to a cooling rack. Pour the mirror glaze (at 35 C). Set it set. And put the glazed sphere on to the circular chocolate base. Sprinkle some chopped hazelnut on top as decorations. It seems like you have got all best flavors sorted in one piece. I love how well that you did your layers. It looks very well balanced to have chocolaty and buttery as well as fruity and crispy texture. Such enticing treat would be fabulous after exams and assignments. Wish I can try this beautiful in person. I have always been a big fan of your creations. Even enjoy rereading each mouthwatering post. But of course, everyone needs a break once in a while. Hope you will enjoy your vacation in Brisbane. This is absolutely beautiful 😭😭 and really delicious!!!! Aww thanks a lot! More to come! The dessert looks so lovely and sophisticated. Really good attempt! Thanks! I’m glad that I pulled this off as well!